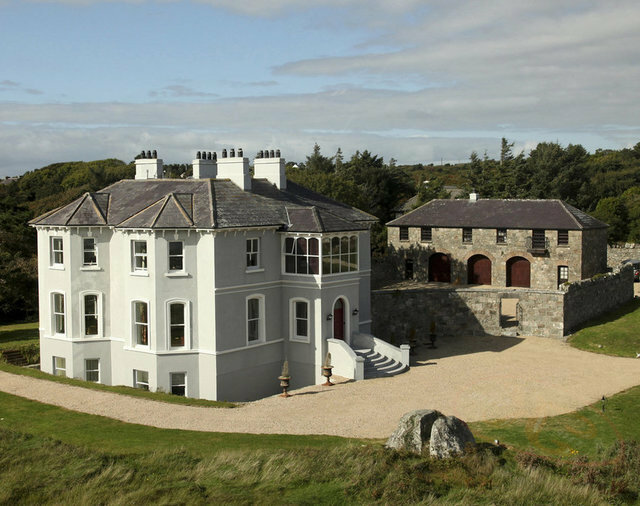 A spectacularly positioned historic home on the shores of Galway Bay with panoramic views over the bay and direct access. Offered for sale on circa 9 acres or 3.6 hectares with lands extending to the high water mark of Galway Bay. In all some 7,061 square feet or 656 square metres of accommodation provided between the main house and courtyard apartment(s) and comprising 4 bedrooms in total (including the master bedroom suite). Presented in excellent condition Ireland House is a most attractive Victorian home comprising two storeys over a raised basement or lower ground floor. Positioned within private grounds of some 9 acres (3.6 hectares) splayed steps lead to an entrance porch, itself contained within a three bay façade and adorned with a first floor glazed sun room. The bay front façade facing southwest has two half hexagon bays, extending to full height and ensuring an abundance of natural light into all the principal rooms and allowing the dramatic views to be enjoyed. Benefiting from a comprehensive restoration the entire property is in excellent condition and presents a thoroughly comfortable historic home. Much care has been taken to retain a period character while creating a home suitable for contemporary living and comfort. The accommodation is well arranged with the dining room, drawing room, study and kitchen all accessed from the reception hall on the ground floor. The lower ground floor further providing a cinema room, home office, gym, wine cellar and laundry room. The upper floor has a master bedroom suite, two further bedrooms and a glorious family bathroom which includes the sun room above the porch. In all the accommodation within the main house comprises some 5,330 square feet (495 square metres). Furniture and furnishings are included in the freehold sale. Positioned within an enclosed courtyard to the rear of the house a handsome stone coach house has been converted to provide three garages, an apartment (1 bedroom) and a generous games room with a bar. The high specification of the restoration ensures that all the buildings are well insulated and the Eco maintenance allows management from overseas, making Ireland House ideal as a vacation property, or indeed as a comfortable family home. A helicopter landing pad has allowed easy access from Ireland’s principal airports together with London. The pleasure grounds immediately around the house are well manicured and lead to delightfully wilder rough meadow lands with outcrops of limestone and leading down to the shores of Galway Bay. A design gazebo is pleasantly positioned off the courtyard on the western façade of the house and has a large hot-tub that enjoys simply marvellous views. Situated on the periphery of a small and quaint Gaeltacht village just a short drive from Galway city centre and gloriously overlooking Galway Bay. The position of Ireland House is quite magical and rare, few houses having grounds enjoying the benefit of stretching down to the high water mark. Galway Bay is a large bay on the west coast of Ireland, between county Galway and the Burren Mountains in county Clare. The scenery is extremely picturesque. Galway city is famed for its mix of traditional pubs, traditional Irish music scene, stone clad cafés, deep water harbour, boutiques and art galleries. The Galway Bay sailing club is located in nearby Oranmore.